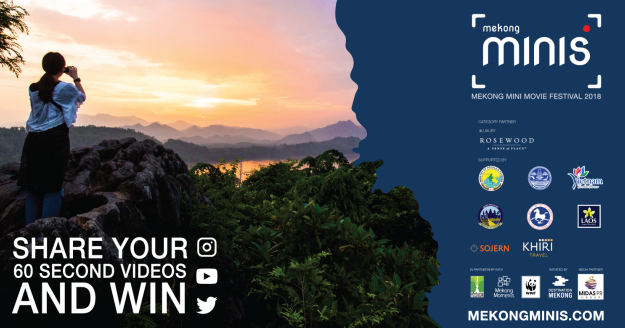 Nakhon Phanom (Thailand) – June 15, 2018 (travelindex.com) – For the first time, Destination Mekong is hosting the 1st Asia Film Destination Conference, as part of the Mekong Mini Movie Festival, co-located with the 2018 Mekong Tourism Forum on June 26th in Nakhon Phanom, Thailand. Emceed by famed storyteller and early Lonely Planet Book author Joe Cummings, and chaired by H.E. Pongpanu Svetarundra, Permanent Secretary of the Ministry of Tourism and Sports of Thailand, the conference explores the power of movie productions and user-generated videos and how they can be integrated into destination marketing. In light of recent events, the first edition of the Asia Film Destination Conference is dedicated to Mr. Anthony Bourdain, a visionary storyteller who in many ways was a trailblazer in how we create travel content today, video in particular. His work with the CNN brought remote spots of the globe into peoples’ homes and inspired many to travel and explore the world with a new sense of curiosity. Today, tourists are more experienced and are looking for new destinations and new experiences. Numerous films have inspired millions to visit destinations. Especially in recent years, there has been a growing phenomenon that tourists visit destinations featured in films and user-generated social media clips. Recent research suggests that movies can have a strong influence on tourist decision-making and that films do not only provide short-term tourism revenue but can build long-term prosperity in a destination. Several countries and destinations quickly understood these advantages and have successfully increased the number of tourists through the magic of films. Rob Holmes, CEO of award-winning destination film production company GLP Films will kick-off the conference with an overview of the power of film to tell the story of a destination. In the Greater Mekong Subregion, there have been various films that have put destinations in the region on the map, starting from the Tomb Raider movies with Angelina Jolie in Cambodia, The Beach with Leonardo DiCaprio in Thailand, Rambo in Myanmar, Kong in Viet Nam to the hit Chinese comedy film “Lost in Thailand”. Lost in Thailand in particular, has resulted in large numbers of Chinese tourists flocking to Thailand. Deepak Ohri, CEO of Lebua Hotels & Resorts will present a case study of “Hangover 2”, which was filmed at the Bangkok property and put the hotel in movie theatres worldwide. Ms. Sirinart Theenanondh, Chief of Film Business Promotion, Thailand Department of Tourism will explain how countries like Thailand compete for movie productions, while Ms. Titiporn Manenate, Director International Advertising, Tourism Authority of Thailand will demonstrate how Thailand has used film and video to attract visitors to visit Thailand. Mr. Gopinath Parayil, CEO & Founder of The Blue Yonder from India shows how his award winning films have introduced community-based tourism projects in his country, while Lao based film maker Mr. Cyril Eberle. who directed films like “A day in a Buddhist Temple” as well as upcoming documentary “A little Land of Mines” how visual storytelling can make a positive impact and can create positive change. Video Bloggers also have the power to influence consumers on where and how to experience a destination, especially in a world where user-generated content receives increased trust from consumers. Video blogger Art Thomya shows how brands can work with travel bloggers and what kind of content can promote destinations. The annual campaign that continues until the end of the year is giving out the first set of country and category prizes right after the Film Destination Conference. The Mekong Mini Movie Festival Award Ceremony is chaired by H.E. Weerasak Kowsarut, Minister of Tourism and Sports of Thailand. Uniquely, one of the prizes is the Industry Choice Award which allows Mekong Tourism Forum delegates to vote for their favourite Mekong Mini Movie during the Screening. Other prizes include the Editors Choice Awards, judged by an expert jury and the respective Tourism Ministries of the Mekong member countries, the luxury category prize is sponsored by Rosewood Hotels & Resorts. Winners will receive the specially designed Dolphin Trophy created by Thai designer Thanwin Kamyeam in addition to once-in-a-lifetime trips in the region worth up to USD 16,000 each. Submissions to the next set of prizes will close in October 2018. 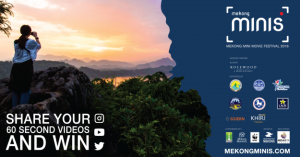 The final prizes of the 2018 Mekong Mini Movie Campaign will be announced at the 2019 ASEAN Tourism Forum in Halong Bay, VietNam on January 15th. For more information about the Mekong Minis and participation, please visit www.mekongminis.com . The Mekong Minis is a unique film festival that celebrates the many faces and experiences of the Greater Mekong Subregion and promotes the region as a single tourist destination. It is an annual regional tourism marketing campaign with its first instance in 2018, supported by all Tourism Ministries and the private sector in the Greater Mekong Subregion. The festival is targeted to attract amateur and professional movie-makers and create a large amount of content for the region with promotions and screenings internationally. The Mekong Minis campaign is powered by Mekong Moments. Destination Mekong was created in 2017 to promote the Mekong region, comprising of Cambodia, PR China (Provinces of Guangxi and Yunnan), Lao PDR, Myanmar, Thailand and Vietnam as a single tourism destination to stimulate responsible and sustainable development and investment, and drive inclusive growth. Endorsed by the Mekong Tourism Coordinating Office and aligned with the mandate of the regional collaborative tourism framework of the six member governments of the Greater Mekong Subregion, Destination Mekong executes targeted projects and initiatives via public-private partnership investment structures, including Mekong Moments and Mekong Trends, led by UNWTO Affiliate Member Chameleon Strategies. The Mekong Tourism Coordinating Office (MTCO), located in Bangkok, was set up with funding from the governments of the six Greater Mekong Subregion (GMS) countries – Cambodia, the People’s Republic of China, Laos, Myanmar, Thailand, and Vietnam. The MTCO, which operates on annual financial contributions from each GMS country, acts as the secretariat for the GMS Tourism Working Group, comprising of senior officials of the six GMS countries’ National Tourism Organizations, to coordinate and facilitate sustainable tourism development of the GMS in line with the United Nations Millennium Development Goals, and promotion of the Mekong region as a single travel and tourism destination, in collaboration with the public and private sectors. The MTCO manages its award-winning Mekong Tourism.org digital platform as a one-stop platform to promote responsible and sustainable tourism in the region, as well as the annual Mekong Tourism Forum, whose hosting is rotated among GMS countries.